SponsorPitch, well-known as the go-to resource for prospecting for new partners, is proud to launch SponsorPitch Proposals, a brand new feature on the SponsorPitch platform that allows sponsorship sellers to post proposals and sponsors to filter, review, save and contact proposal owners. Proposals is a big step in our goal of making SponsorPitch the essential destination for not only sellers prospecting for the right new sponsors at the right time, but also sponsors looking for targeted and unique new sponsorship opportunities. Proposals will be replacing our Referrals program and there will be no commission for successful connections so if you previously uploaded a sponsorship opportunity on Referrals, you'll just need to do it again at sponsorpitch.com/proposals/new. To upload a proposal, you'll first need to be affiliated with a property and then select that property from the dropdown, fill out the rest of the form and upload your attachment (PDF, PPT recommended). We've already gotten quite a few great proposals (e.g. 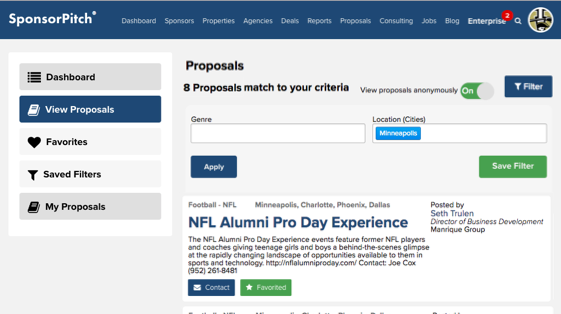 NFL Alumni Pro Day Experience) in just a couple of days and this will be constantly evolving as new proposals are added and edited, so if you're a sponsor or an agency keep an eye on View Proposals to see what's new! Proposals are visible on the platform to other members once you upload them and they can be updated or deleted by the proposal owner at any time. Finally, if you're not ready to pay for a subscription, no sweat. Sellers can upload one proposal for FREE and Sponsors can view proposals for FREE. Going one step further, SponsorPitch doesn't take any commission on connections made through Proposals. To those who already subscribe or would consider subscribing, what are the additional benefits you'll be receiving with the addition of Proposals? Thank you for all your support as building on the SponsorPitch platform would not be possible without the support of our loyal subscribers! Over the course of the fourth quarter, we plan to invest even more in Proposals, as well as other aspects of the platform, increasing the value we deliver to you.